2018 Mahindra XUV 500 is one of the Best and value for money SUV available in India Mahindra has done an amazing job, XUV 500 is a flagship model from Mahindra till now.XUV comes with many features and company keep updating its model since 2011.2018 Mahindra XUV 500 has 6 airbags which are best in class.This time Mahindra also include many Automatic variants to XUV 500.This XUV is available in 8 colors.It has Mhawk 140 engine which is adequate for all type of driving conditions.This 2018 Mahindra XUV500 Infographic Contain all important information regarding XUV. 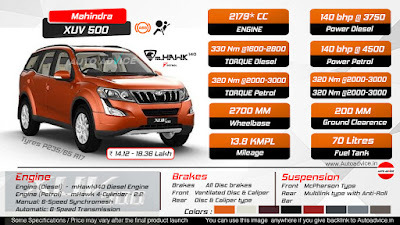 The Mahindra XUV500 comes with tons of unique features. The 7-inch infotainment touchscreen system now loaded with Android Auto.There is also a voice recognition system which lep in messaging, voice commands and SMS readout.as part of the package. The base variant though gets a 6-inch monochrome infotainment display with Bluetooth audio, USB, iPod connectivity, hands-free, and an integrated music system with CD and MP3 player. In term of safety, the 2018 Mahindra XUV500 has dual front airbags and ABS with EBD as standard across all variant. The top-trim though gets side and curtain airbags as well bringing the total to 6 airbags. Other features include Electronic Stability Program (ESP), hill hold and hill descent control, crumple zone and crash protection. The base model of the Mahindra XUV500 – W4, W6, and W6 AT come with steel wheel covered with full wheel caps. On the other hand, the top-trims – W8, W8 AT, W10 and W10 AT come with 17-inch dual 5-spoke alloy wheels. The tyres on all variants are P235/65 R17, radial tubeless tyres and all four wheels come with disc brakes as well. 2018 Mahindra Xuv500 comes with 2179*cc mHawk140 Diesel Engine.That gives Max Gross Power of 103 kW (140 bhp) @ 3750 rpm for diesel engine and for petrol engine it gives 103 kW (140 bhp) @ 4500 rpm.Max Gross Torque for Diesel engine : 330 Nm @1600-2800 rpm and maximum torque for Petrol engine: 320 Nm @2000-3000 rpm. One glance at the New Age XUV500 and you know its captivating, cheetah-inspired styling breaks the mould of the ordinary. Up front, the new static bending projector headlamps with light guides embrace the bold and intimidating new stylish front grille. The addition of stylish black accents, brings alive the cheetah’s unmistakable tear ducts. The bonnet has been raised to mimic its strong and slender shoulders. And its new chiselled and sculpted lines catch the eye. Enhanced further with sleek chrome accents and stylish new alloy wheels, the XUV500 has been completely overhauled. But one thing has stayed the same. Its enthralling and majestic presence on the road. 2018 Mahindra XUV500 Price is varied from 14 lakh to 18 lakh.This is a good value for money SUV available in india .200 MM ground clearance is good fo off-road driving and bad indian road.It has a decent mileage figure 13.8 KMPL.If your budget is around 14 to 18 lakh the you should check this model and take a test ride to decide if this fulfill all your requirements .